In case I haven’t given you enough options for Saint Patrick’s Day, here’s another one: Extra Stout Beef Carbonnade. 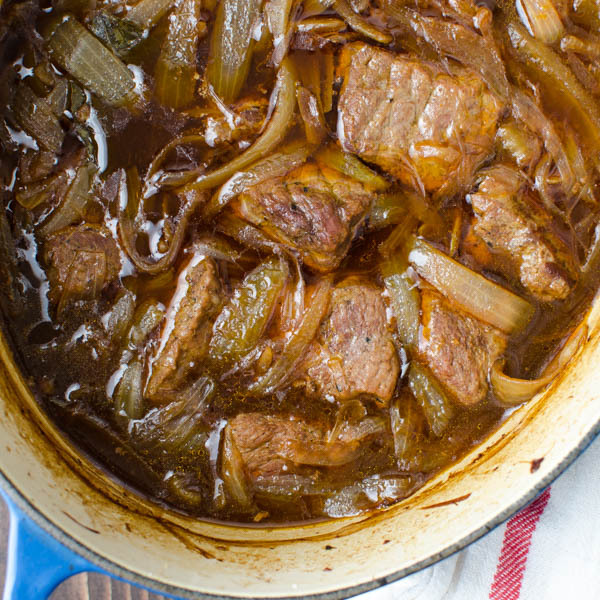 Who needs corned beef when you can slow braise chunks of chuck roast in Guinness, right? Right! 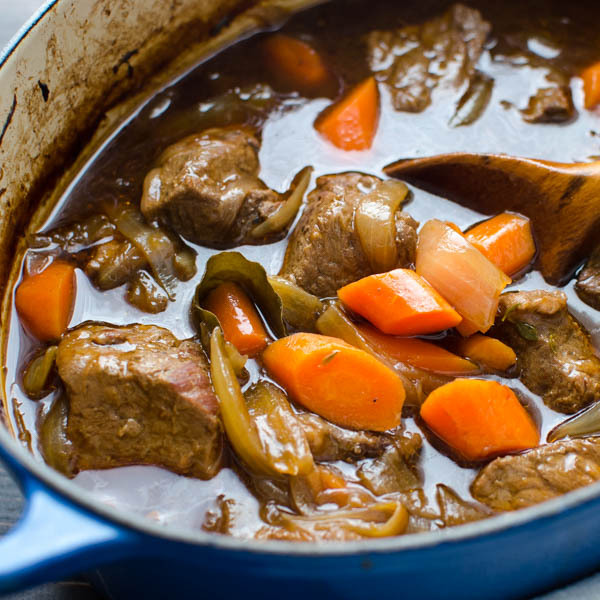 Carbonnade A la Flamande is actually a Flemish beef stew. But really it’s so much more. 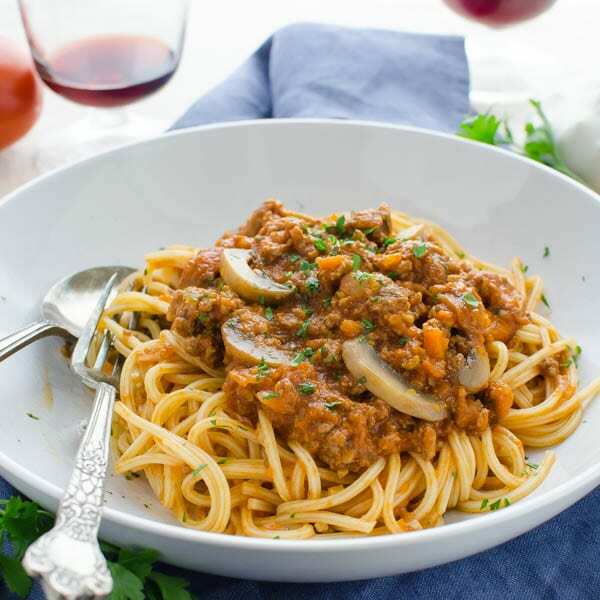 Big chunks of seared and simmered beef in a velvety sauce. 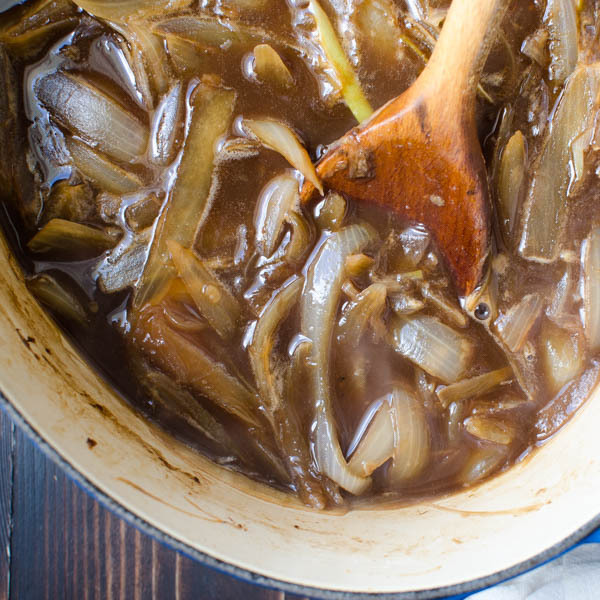 It’s deep, rich and malty with onions that are cooked so long, they practically melt into the gravy. 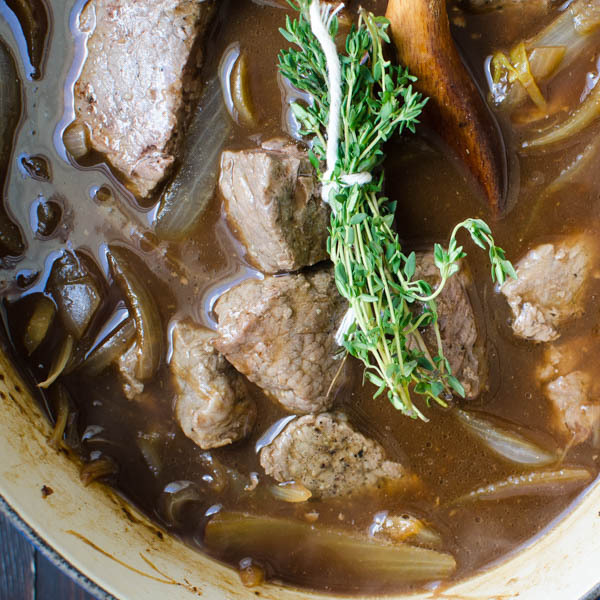 Simmering the sauce with the beef, onions and herbs in a low oven for two hours, concentrates the flavors and fills the whole house with the most mouth-watering aromas! 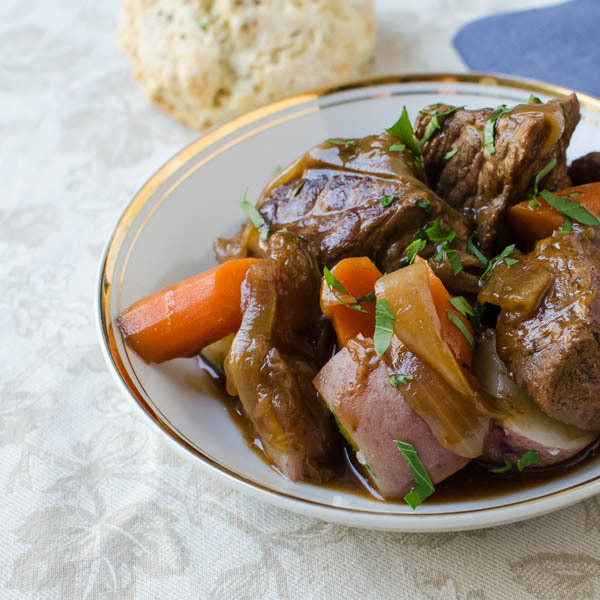 This is the ultimate beef stew! 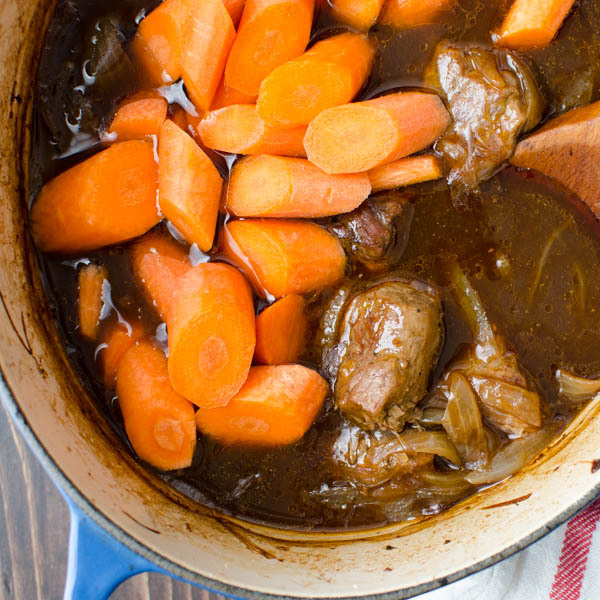 After braising for an hour and fifteen minutes, add the chunks of carrots and return the covered pot to the oven. The carrots will cook to a perfect tenderness without becoming mushy or disintegrating into the sauce. 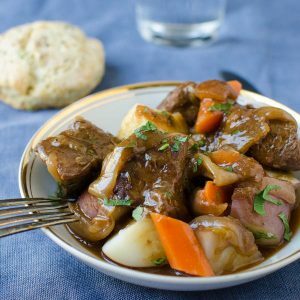 The finished product is a hearty stew with a rich, velvety sauce, that you simply can’t get enough of. 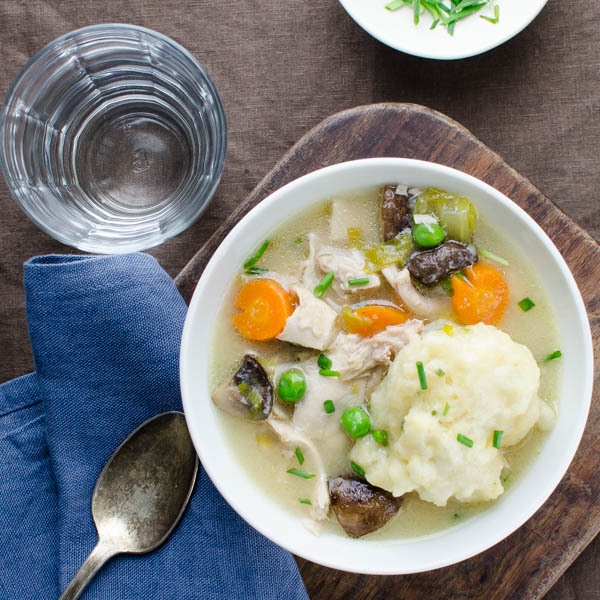 Serve it with boiled red potatoes or cooked egg noodles and some Irish Soda Bread to soak up every bit of that lush gravy. I didn’t have to call Scott to the table tonight – the carbonnade did it for me! 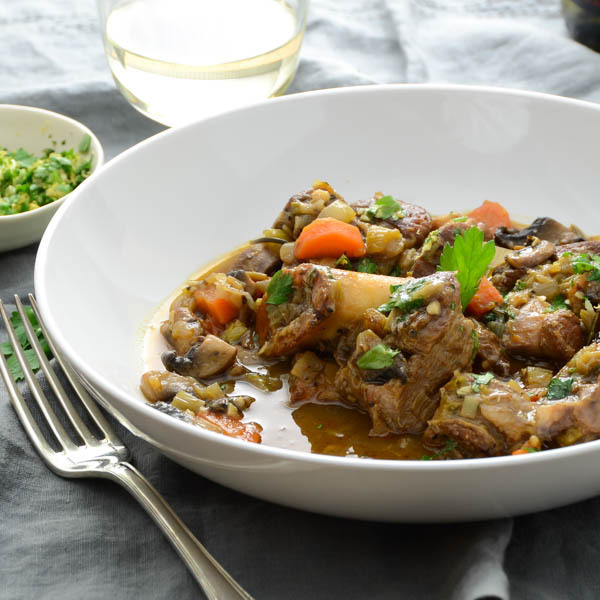 This rich, meaty stew is just the thing for a chilly evening! Sprinkle the chunks of beef with 1/2 teaspoon salt and the pepper. Heat the butter and oil over medium high heat in a large dutch oven. Add the chunks of beef and brown them all over, turning occasionally with tongs. Transfer the meat to a shallow bowl. 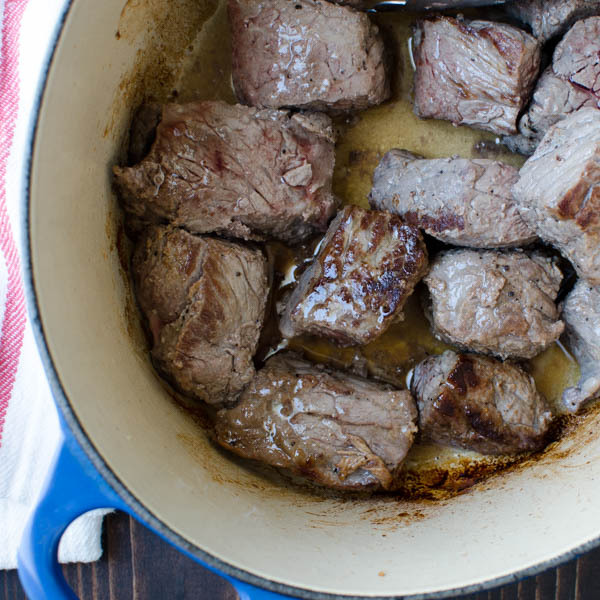 If there is significant liquid in the pot, pour it over the beef. Add the remaining tablespoon of olive oil to the dutch oven. 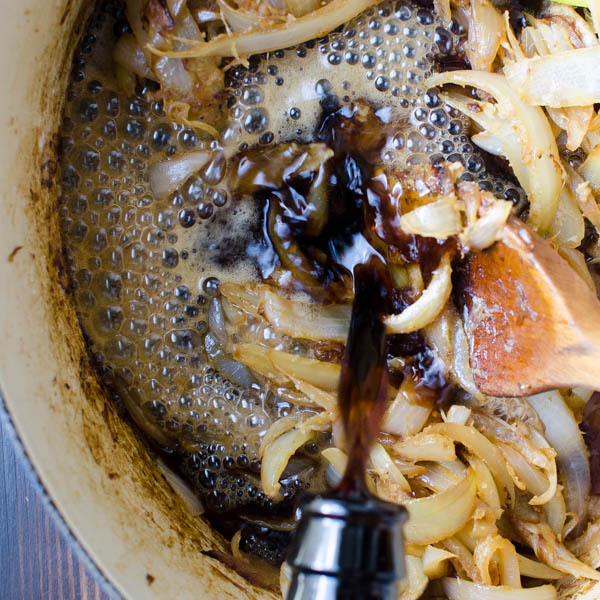 When oil is hot, add the onions and remaining 1/4 teaspoon kosher salt. 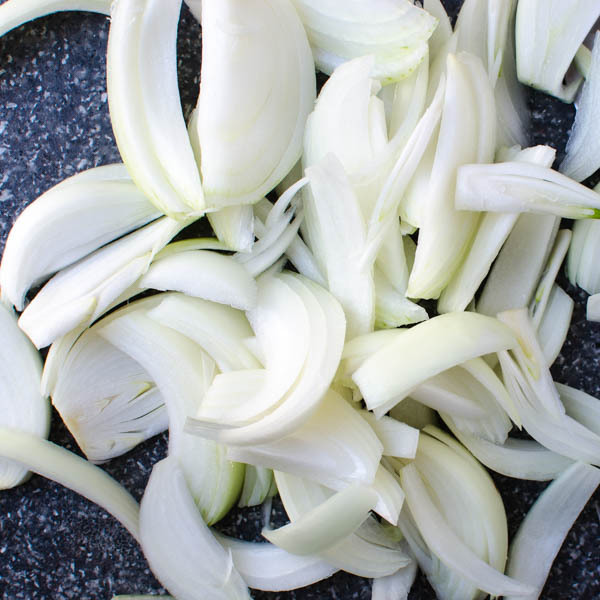 Stir to combine and cook the onions over medium heat, until they are softened and start to take on some color. about 10 minutes. Sprinkle the flour over the onions and stir until well combined and flour doesn't appear dry anymore. Add the beer, beef broth and tomato paste. Stir to combine. Transfer the beef back to the pot along with any accumulated drippings. Add the bundle of thyme (about 5-6 sprigs) and 2 bay leaves. 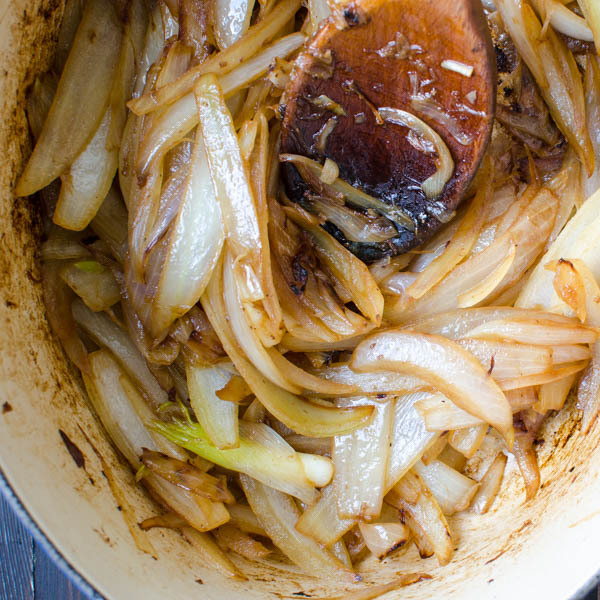 Place the lid on the pot and braise in the oven for one hour. Stir the carrots into the pot and continue to braise, covered for one hour. Taste for seasoning and add additional salt or pepper if desired. Sprinkle with chopped parsley. Serve with boiled red potatoes or buttered noodles. I use about 5-6 sprigs of thyme tied with kitchen string and 2 bay leaves. I know it sounds cliche, but this really does look mouthwatering! Pinning for later, this is the kind of food I dream about! 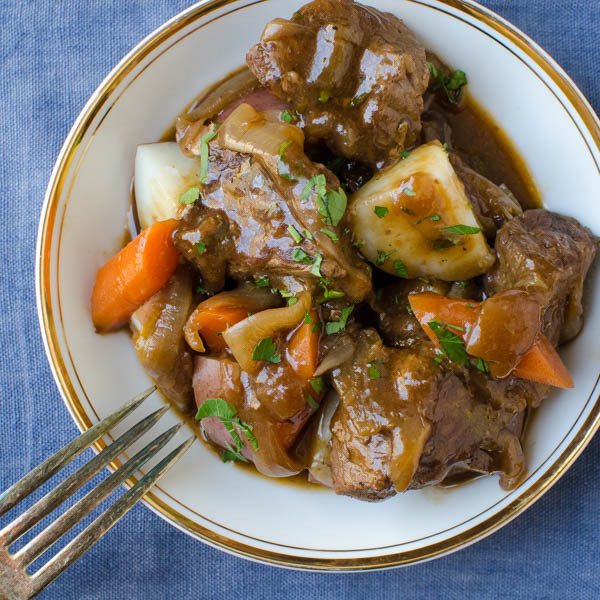 Braised stews are one of my favorites. I hope you like it! Oh my! This looks delish! I love how hearty it looks. Oh my god I’m so excited that winter is just around the corner in our part of the world because THIS will be happening ASAP! That would have to be the most delicious sounding beef stew I’ve ever heard of. 😀 Thanks for sharing! just curious… what part of the world are you from??? Oh, that sounds like layers and layers of deep, rich flavor! 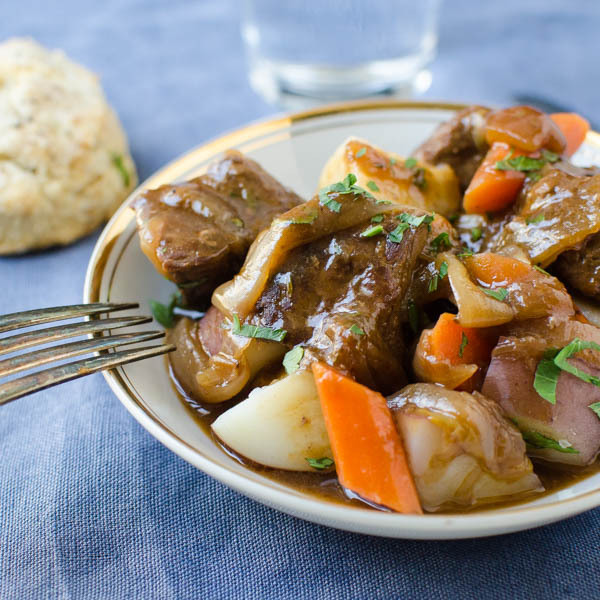 Nothing like a really hearty, well seasoned beef stew. Wow this looks so juicy and delicious! Will be making this for my hubby soon! Mine nearly licked the plate! Oh man, this looks AMAZING! It seriously does sound like the ultimate beef stew. I wasn’t hungry when I started reading this, but I am now! Pinning for later! The stout gravy MAKES IT! I’m with Gloria, above. I don’t really reach for beer to drink it, but I like to cook with it! I like a sip of my husband’s beer on a hot day, but I can’t drink a whole one. They put me to sleep. But I love to cook with beer! So many possibilities! Funny I don’t like beer, but I like cooking with it. This sounds like the perfect comfort foo. 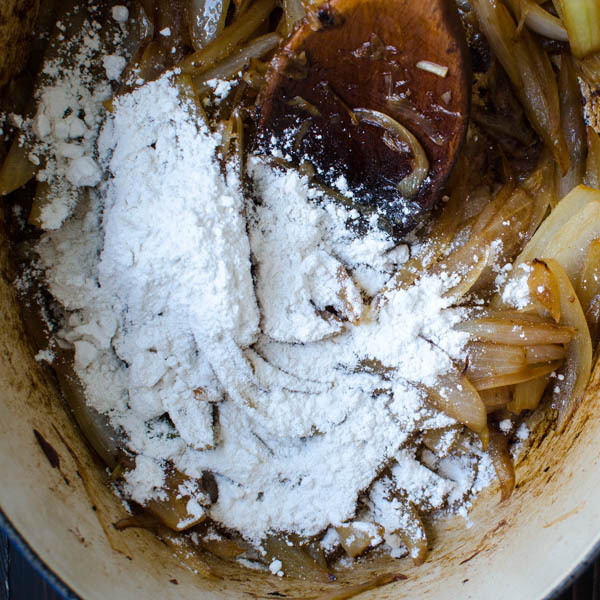 I love using my cast iron dutch oven….I see you do too. I actually have two of these dutch ovens. Would it be greedy to want another one? Oh wow! I could go for a big comfort-food bowl of this stew! I know, who doesn’t love a good stew?